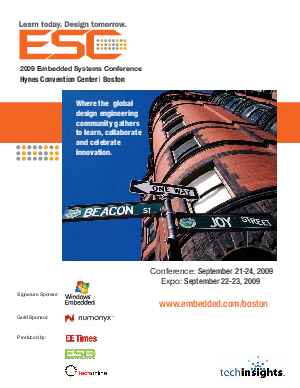 Join us at ESC Boston, September 21-24 at the Hynes Convention Center, in Boston, MA. Expo registration is FREE, and advanced registration pricing is still available for conference packages. ESC is the embedded industry's Leading Embedded Systems Event. Now in its 17th year, ESC brings together the largest community of designers, technologists, business leaders, and suppliers all in one place. Practical design information you can use today. Skills you use for a lifetime.